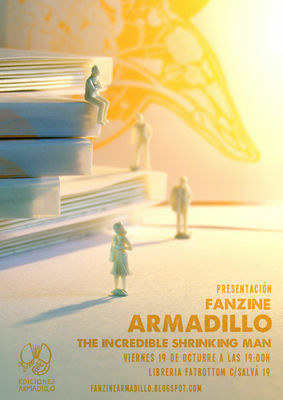 Presentación Fanzine Armadillo "The Incredible Shrinking man"
Armadillo Fanzine presents its new issue. Theme is the novel and movie, "The Incredible Shrinking Man"
This issue also has 20 illustrators and illustrators. Edition of 200 copies in their boxes, folded and glued by hand with much patience and care. Accompanied by a peculiar and very small surprise in every box. And benefit to publicize their new adventure with the self-publishing new projects: Edicions Armadillo! We hope to see everyone. Armadillo Fanzine: directed and commanded by Araiz, Juan and Irati.